TORONTO – Every athlete is a product of his or her upbringing. Few bare their roots quite as nakedly as Nicolas Lodeiro. A pair of local boys will help lead the Sounders into their first MLS Cup title game on Saturday at Toronto’s BMO Field. Coach Brian Schmetzer has Seattle soccer in his blood, going all the way back to his Lake City Hawks days in the 1970s. Equally earnest Jordan Morris is the homegrown product turned MLS Rookie of the Year out of Mercer Island. Seattle’s 28-man roster includes players from 12 different countries, with all kinds of unique histories and colorful back stories. Few characters, however, are as central to the Sounders’ late-season run at history than Lodeiro, who is so Uruguayan that he might as well have that country’s famous baby blue uniform peeking out from beneath his Sounders shirt. To understand how Seattle has edged so close to the brink of its first big-league soccer championship, face southeast and go almost all the way down the South American coastline. Statistically, the historic relevance of the Uruguayan men’s national team doesn’t compute. Uruguay, with a population of 3.4 million as of the most recent census, is by far the smallest country to have ever won the World Cup – and it has done so twice, in 1930 and 1950. La Celeste also holds the record for most Copa America titles, having won the prestigious South American championship 15 times, most recently in 2011. How to explain the discrepancy between modest population and outsized results? English soccer journalist Jonathan Wilson has described the Uruguyan phenomenon of garra: grit or guts, a national pride in triumphing when the odds are most against you. The most famous example was the World Cup final in 1950. The morning of the game, so favored was host Brazil that an early edition of a Rio de Janeiro newspaper ran a headline describing their boys as world champions. Uruguay’s captain bought every copy that he could find, brought them back to his hotel bathroom and encouraged his teammates to urinate on them. Uruguay won 2-1. That, Wilson wrote, is garra. That is Uruguayan soccer. Sounders midfielder and former Uruguay international Alvaro Fernandez describes the ethos as a willingness to die on the field for victory. The modern personification is Luis Suarez – who is equal parts famous for his FC Barcelona goal-scoring prowess and infamous for biting Italian defender Giorgio Chiellini during a 2014 World Cup match. Despite this somehow not being the first time Suarez had bitten an opponent during a game, his Uruguayan teammates lined up behind him in a public show of support. Garra. It was Suarez, of all people, who helped translate a conversation between Lodeiro and Seattle general manager Garth Lagerwey when the latter was trying to convince the playmaker to come to Seattle earlier this summer. Suarez and Lodeiro are often roommates while with the Uruguayan national team. Hey, in a country of 3.4 million, the world is smaller than you might think. Lodeiro’s first image of the United States was formed from American cinema, grainy VHS shots of the New York City skyline. He was surprised, when he first visited that city as an adult, just how close the picture in his mind was to reality. “I’ve always wanted to come to the U.S.,” Lodeiro said. That was more of a vague someday than an actual plan until his agent notified him of the Sounders’ interest earlier this year. He called Fernandez, who previously played for Seattle from 2010-2012 and who offered unambiguous advice. On Lodeiro’s end, it wasn’t quite so simple. He was still just 27, at the height of his prime rather than the stereotypical end-of-career MLS Designated Player cashing one last paycheck. He was getting regular minutes at Boca Juniors, perhaps the most pedigreed club in the Western Hemisphere. Yet on some level, the move just clicked. His first child, Leandro, had recently turned 1. His wife, Micaela, who he’d met back in Uruguay – “even before I was a soccer player, she was with me,” Nicolas says – also shared his desire to seek new horizons. The added stability of raising their young family in the U.S. was another benefit. 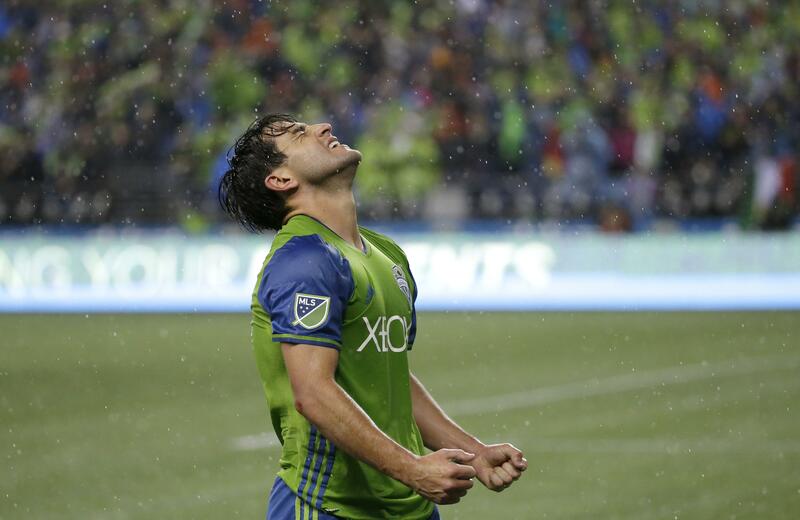 Lodeiro breaks from the mold of soccer playmaker as a fragile creator. He’s everywhere, and he has not been cowed by MLS’s famously physical style. There is something ravenous in the way he plays. Lodeiro tracks back in defense, kicking at opponents’ ankles. Give him time on the ball and he’ll tear you apart, either by setting up teammates or running at you himself. Nor is he above deploying some dark arts every so often. Some of that is innate. It is, he’ll tell you, simply the way he’s always played. There’s the added motivation of providing for his growing family, too, and making good on those dreams inspired by American videotapes. There’s also garra. Lodeiro’s “shoe phone” celebration has a deeper significance now than it did when he first busted it out in 2009, when he was playing for a club in the Uruguayan capital of Montevideo. Nicolas’ father, Alfonso, taught him the game, passing along his love for the sport to his son. Their native Paysandú, however, is a long way from the capital, tucked up northwest on the Argentine border. When his son’s career started taking off, Alfonso didn’t often get to see him play. “A phone call was all we really had to connect us and really talk about the results on the field,” Nicolas said. Thus began the tradition, after every big goal or whenever he was feeling particularly homesick, of taking off a shoe, pretending to dial into the laces and holding it up to his ear. The gesture has had extra poignancy since 2011, when Alfonso died. Ever since, Lodeiro usually points upward at the sky, too. Raw emotion was sketched on his face when he scored his first goal with the Sounders, in a 2-1 win against Real Salt Lake at CenturyLink Field in August, taking a few extra seconds to soak them all in. “Without a doubt, I am playing soccer because of him,” Lodeiro said. “He was the first one to teach me to play soccer and to teach me the right values as a person. After he left, my desire has been to offer him the best that I can, to enjoy the soccer as he would have wanted it. There’s one more thing, father would tell his young son just before sending him out on the field. If you’re going to play, you might as well have fun. And if you’re going to have fun, you might as well win. Published: Dec. 9, 2016, 10 p.m.